Windies skipper Holder was delighted with his team's performance. They were criticised a lot during the Test series for not playing well with many even questioning even if they belong to this level. But Windies never lost heart and have only improved on this tour. If the second ODI denied them the victory, they upped their game a notch to stun Team India who went in with a batsman short and the same problem eventually cost them. Virat Kohli’s ton once again failed to win his team the match and the captain understandably looked disappointed with the loss. Chasing the total of 284 runs to win, Rohit Sharma was undone with a superb outswinger by Jason Holder after which Shikhar Dhawan once again failed to convert his bright start. Well, after early wickets, few thought it would be good for the Indian middle-order as they will get a hit in the middle-order. However, the line-up comprising Ambati Rayudu, Rishabh Pant and MS Dhoni completely failed to deliver and the onus was on Kohli to do it. The Superman of Indian cricket tried hard and in the process, also reached his 38th ODI ton. 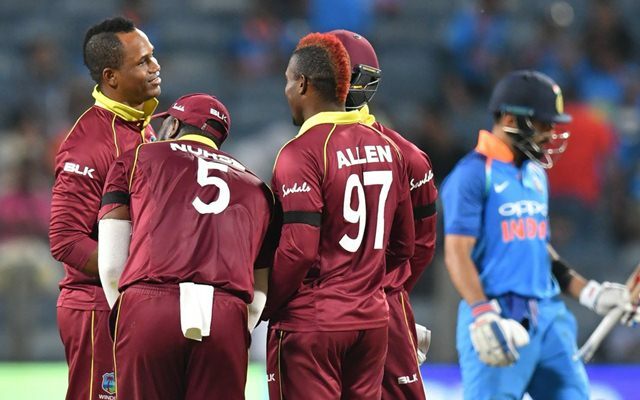 But Marlon Samuels’ quicker delivery went past his bat to lighten up the stumps and also shatter India’s hopes of a victory as they meekly surrendered the game by 43 runs. Talking about hopes, how can one forget the Windies hero Shai Hope? He has been the pillar of the team in this series. The youngster has gradually improved on this tour and no wonder is piling on the runs in the ODIs. Though he missed out on a well-deserved century today, Hope’s knock lent solidity to his team’s batting. The credit has to be given to the lower-order which didn’t gift their wickets away for the third consecutive time in this series. After losing eight wickets at 227 runs with more than six overs to go, India were expected to bundle them out in the next couple of overs. In contrast, Ashley Nurse played his heart out and Kemar Roach was always there to support him as they stretched the total to a competitive 283 runs after 50 overs which eventually proved enough. I guess it was my day. I guess I played with a lot of free spirit. When Shai got out, I had to do something because the score was not that big. Sometimes you can be the hero, sometimes it can go down to zero as well. If I get a chance to win the game, I back myself to do it. Just dedicating the celebration to my Indian friend – Sunny Sohal, whom I met at the CPL. He told me, when you get a wicket do a ‘Babaji ka thullu’ or something. Credit to the boys. We hung in the game for as long as possible. I should have gone deeper. Something to learn there. We hung in there. They were probably a batter short. We knew if we remove Dhoni, we could get in to their lower order. He is a competitor. I know what to expect from him. He keeps it tight and gives us wickets at regular intervals. The guys are learning better. We just need to be consistent. We need to buck up more. If you want to beat one of the best teams, you have to be consistent in all aspects of the game. We bowled pretty well. I think the wicket was not offering much in the first 35 overs. Later half it became difficult. From 227 for 8 we should have been chasing 250-260 at the maximum. The bowling effort was professional just that we give it away in the last 10 overs. It was a pretty gettable total. We did not get the partnerships going, that does not happen too often. In the field we were fine. We didn’t execute our plans to perfection. This Windies side is an explosive side and they can beat any team on a given day. They played better cricket and they deserve to win. Look when Hardik and Kedar both play, we get the extra option. When someone like Hardik is not playing, who gives you both bowling and batting option, it is difficult to get the balance. Kedar comes into the side in the next game, that’ll give us the balance and depth in the batting. You will always drift to one side when you don’t have the balance. We have to think about the perfect balance we need. I don’t want to talk about my batting. It is a bit embarrassing when people ask you the same thing again and again. I wanted to go after him (Samuels) and just did not execute well. Definitely, we have to take the wins and losses in our stride, was just a bad day at the office. Just shake the loss away. Our plans are in place and we just need to execute better. Will Anushka Sharma get married to Virat Kohli this year?